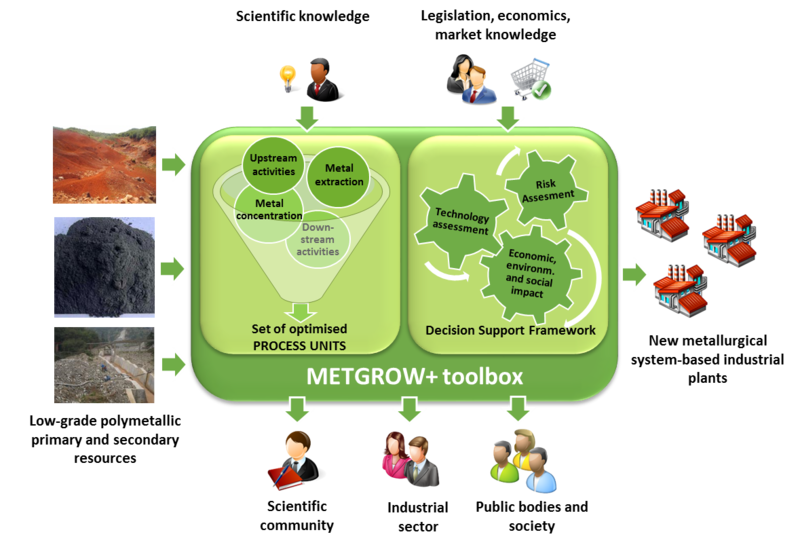 The Horizon 2020 project ‘METGROW PLUS: Metal Recovery from Low Grade Ores and Wastes” is a European research project that addresses and solves bottlenecks in the European raw materials supply by developing innovative metallurgical technologies for unlocking the use of potential domestic metal resources. METGROW PLUS brings together 19 partners from academia, industry and research institutions from across 8 European countries. The project runs from February 2016 to January 2020. METGROW PLUS develops an industrially viable, flexible Metallurgical Systems Toolbox, which consists of a broad range of already existing and newly developed metallurgical unit operations. The unit operations follow a value-chain approach, from pre-treatment, to metal extraction, metal recovery and (residual) matrix valorisation. The Toolbox will allow the combination of pyro-, hydro-, electro-, bio-, solvo- and iono-metallurgical unit operations, as well all matrix valorisation technologies. Both primary and secondary materials are studied as potential metal resources. Economically important nickel-cobalt deposits, low grade polymetallic wastes and iron containing sludges, which are currently not yet being exploited due to technical bottlenecks are in focus. Concurrently, METGROW PLUS targets innovative processes to extract both economically important metals (Ni, Cu, Zn) and critical metals (Co, Cr, In, Ga, Ge, Sb) in a cost-effective way. • To adapt pretreatment metallurgical unit operations to make them applicable for low-grade complex polymetallic, primary and secondary resources. • To develop new metallurgical unit operations for metal extraction. • To improve and/or develop new metallurgical unit operations for metal recovery from the preceding metal extraction step. • To improve and/or develop unit operations for residual matrix valorization. • To validate the New Metallurgical Systems Toolbox through pilot activities, combining different metallurgical unit operations for a given low-grade resource type. Ghent University participates in the development and/or improvement of bio-based technologies for metal extraction and recovery. Bio-based technologies such as bioleaching for metal extraction, and bioprecipitation and biosorption for metal recovery are environmentally friendly alternatives to the high energy demanding hydrometallurgical methods most commonly applied for metal valorisation.